Thirty-five years ago, Gifford Farms brought vegetables and fruits to the Saratoga Farmers’ Market. These days, their stall on Wednesday afternoons also features jars of honey, bottles of maple syrup, and such goods as steamed brown bread. The latter is an innovation of Linda Gifford’s daughter. She creates a quick bread batter, places it in a can, seals the can, and simmers it in water. The result is a spongy, mildly sweet concoction that can be enjoyed in a single meal. These changes reflect the evolving nature of the Saratoga Farmers’ Market primary customer base. When the market began in 1978, farmers served families who prepared three meals a day, six or seven days a week. They relied on farmers not only for fresh produce, meats, eggs, and other products for the week but also on large quantities of seasonal goods for freezing or canning for later use. Even as busy lives and around-the-clock work demands alter how families cook and eat together, locally grown, raised, and made farm-fresh goods remain important. The Saratoga Farmers’ Market staff and volunteers are initiating new projects in response to these changes. The market this year, for instance, has provided an ATM so customers can get easy access to cash. It also has adopted a new FreshFoodNY app as part of a project with the New York State Federation of Farmers Markets to allow customers to pre-order items from market vendors for an easy pick-up. Younger farmers use the changes to fine-tune what to grow. Fisk noted that radicchio – a purple veined leafy vegetable – was a new Owl Wood offering last fall. After it got a good reception, Fisk and Bascom decided to grow more of it this year. A couple of weeks ago, on my way back from a visit to a farm in Washington County, I stopped at Saratoga Apple in Schuylerville. Nate Darrow, who owns and operates Saratoga Apple with Christine Gaud, suggested I try a Williams Pride. 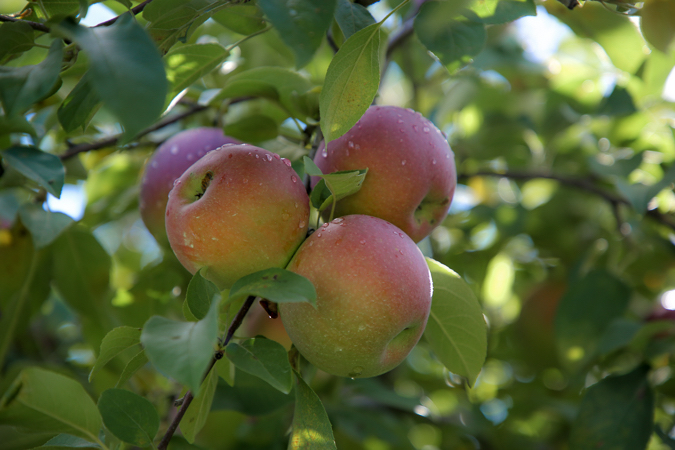 Williams Pride apples are dark red, soft skinned and have a flesh flecked with streaks of red. Their flavor is delicately sweet, like summer itself. You can find them tomorrow at the Saratoga Farmers’ Market with a range of other early apples. But hurry. Tomorrow might be the last chance to savor these fruits of summer before Saratoga Apple’s full array of fall apples roll in. Why such a brief season? According to Darrow, summer apples do not store well. They are thinner and go soft quickly. Unlike most of the many varieties that sustain market goers throughout the year, the summer apples come and go fast. Among the “fragile flowers” are Williams Pride, Pristine, Zestar, Paula Red, and Ginger Gold. Like a bouquet of flowers, they look pretty on a plate, offering a range of colors: deep red, bright yellow, softly sheened green. 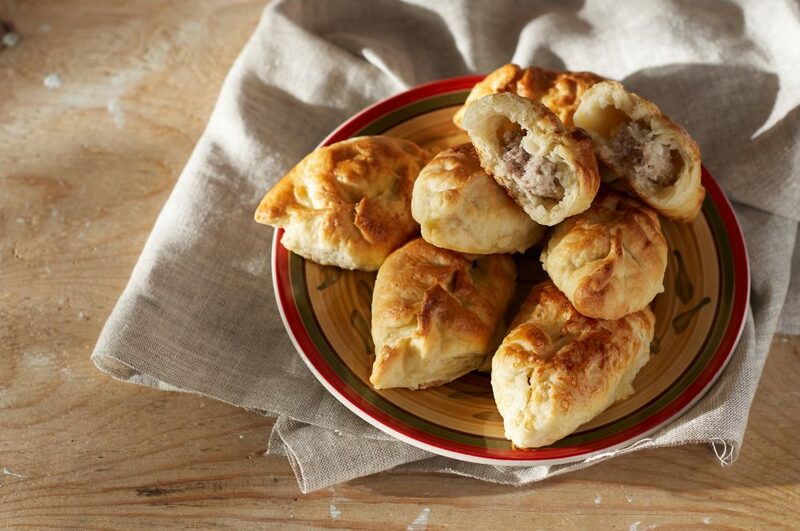 Their flavors also span a broad spectrum: extraordinarily sweet, boldly tart. As I bit into the Williams Pride, memories of childhood surfaced. My family lived in India for a year in 1973-74. We got fresh fruits and vegetables almost daily from a vendor we called the sabzi wallah, which translates to the vegetable seller. He would pull into our compound and call out the residents to come. We would get apples that were small, red, and sweet. This week, the calendar shifted from summer to fall. 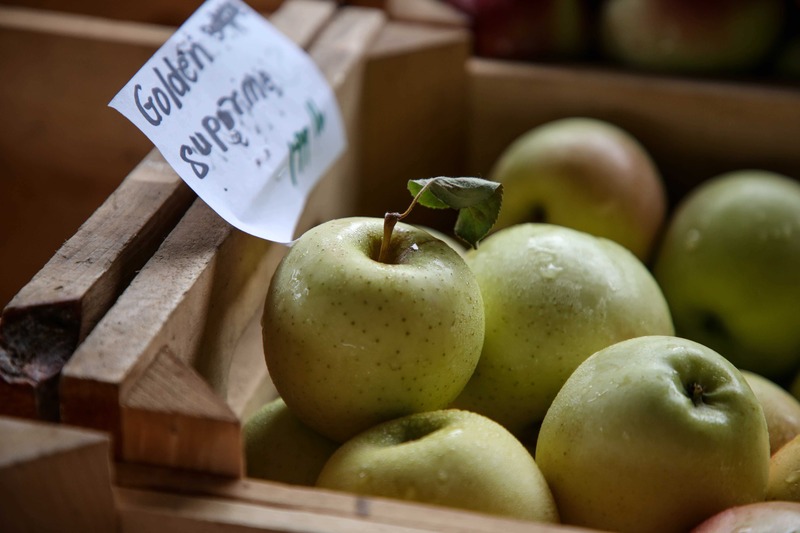 With it, the apples of fall – Cortlands, Empires, Northern Spies, and Belle de Boskoop, among others – are filling Saratoga Apple’s bins at the farmers’ market. Apple crisps, pies, and sauces beckon. But tomorrow I hope to fill my bag with the last of the fragile flowers, for a final taste of summer until the following year. The Saratoga Farmers’ Market is 3-6 p.m. Wednesdays and 9 a.m.-1 p.m. Saturdays at High Rock Park through October 31. Find us on Twitter, Facebook, and Instagram, and on the FreshFoodNY app. E-mail friends@saratogafarmersmarket.org for volunteer opportunities. Bring water to a boil. Add ravioli stirring so it doesn’t stick, and water returns to a boil. Cook pasta until it is tender about 4 to 5 minutes. Test the pasta after 3 minutes if you prefer it al dente. Drain and reserve 2 Tablespoons of the pasta water to create a sauce. Meanwhile, in a large sauce pan or skillet, heat olive oil over medium heat. Add garlic and sauté until light brown. Do not burn the garlic. Add the reserved pasta water. Gently mix in the ravioli. Sprinkle in the parsley and basil. If using Peperonciono, top the dish after plating. 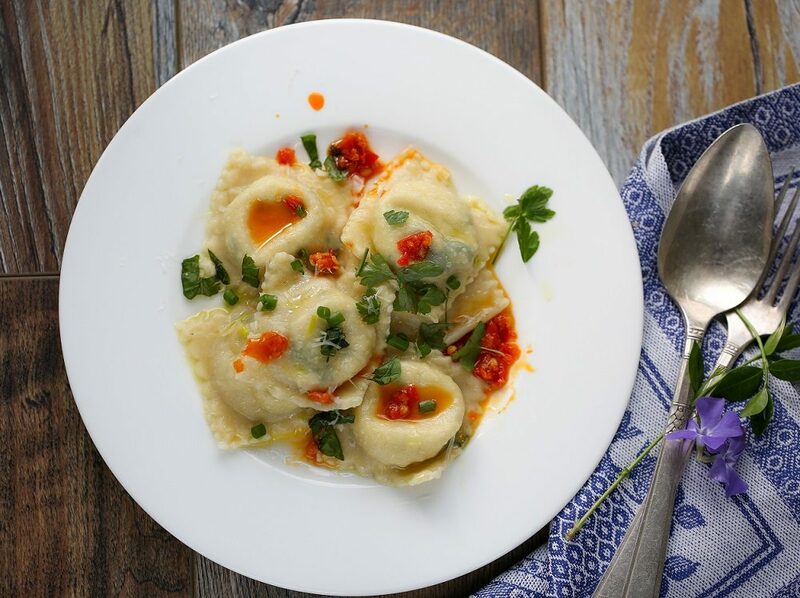 Notes: Peperonciono sott’olio can be purchased from the Dancing Ewe Farm or add ½ Tablespoon of red pepper flakes when you add the garlic. Top with favorite Pecorino (made from sheep’s milk) cheese, e.g. Pecorino Riserva. 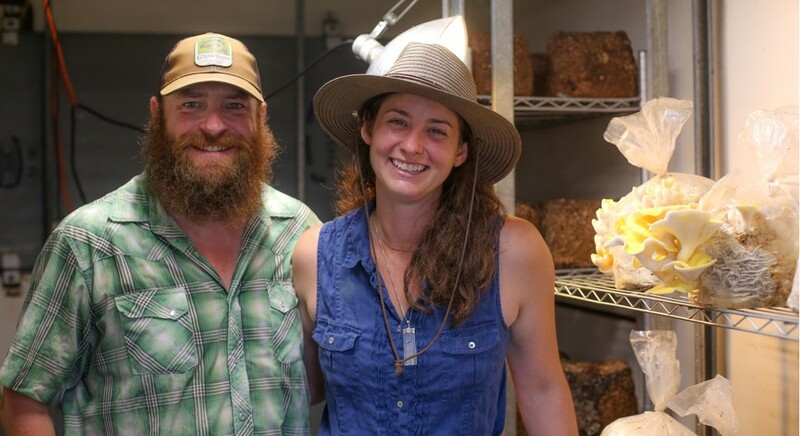 While living and vegetable farming in Fort Collins, Colorado, Ann and Josh Carnes decided to move east, after discovering their Ramble Creek Farm near Greenwich in Washington County. Ann’s background with her permaculture degree from Indiana University and Josh’s experience as a retired lieutenant firefighter and handyman has created a well-rounded partnership in farming. This ambitious couple became vendors at the Saratoga Farmers’ Market less than seven months after establishing Ramble Creek. 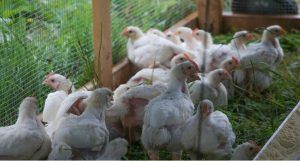 They currently raise mushrooms, blueberries, poultry, and livestock, and are applying for organic certification and starting a commercial kitchen to expand their products. 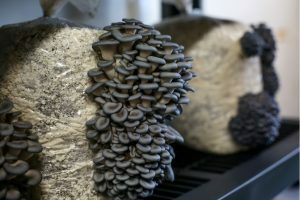 Ann explained, “There is an unfulfilled niche for growing and selling mushrooms.” Currently, they raise a variety of mushrooms such as lion’s mane, shiitake, maitake, and blue and canary oyster, in truck-sized refrigerated coolers. Most of their meat production is still in progress, but they’ll be offering pasture raised chickens in the near future. Beef production will start in October, and customers can pre-order turkeys for Thanksgiving. Ann and Josh emphasize the layout of the land so all animals work together to create a happy and healthy environment. Their heritage breed Berkshire and Tamworth pigs are “forest pigs,” which control the underbrush on the farm’s edge. In August, pork ordered through their website will be available for on-farm pickup. When the pigs move to a different section, they wag their tails excitedly ready to take on the next spot. Ann and Josh will use wood from the cleaned-out sections and watch for new wild plants and ferns. Young chicks and turkeys start their lives in the two barns that are on Ramble Creek’s distinct logo. After growing for several weeks, they continue on pasture. They follow the cattle in movable coops, to eat the plants the cattle haven’t grazed and scratched the soil. When the grass regrows, it is beautiful, rich, nutritious and green. 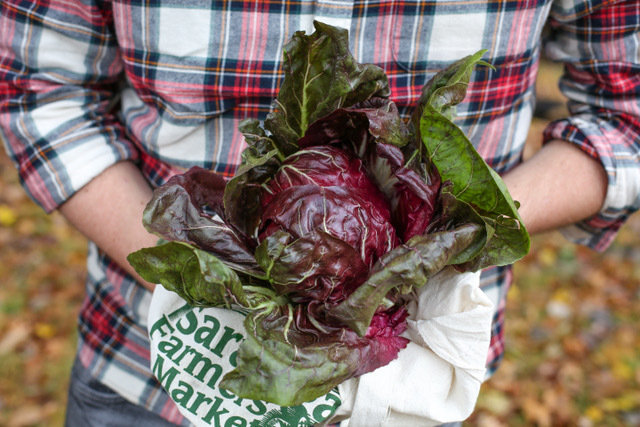 Ramble Creek Farm is as impressive as the products they offer at the Saratoga Farmers’ Market. Visiting their farm showed the dedication Ann and Josh have put towards their land and their animals. Ramble Creek Farm participates at the Market on both Wednesdays and Saturdays. 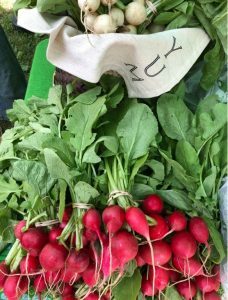 The Saratoga Farmers’ Market is open from 3 p.m. to 6 p.m. on Wednesdays and 9 a.m. to 1 p.m. on Saturdays at High Rock Park. Find us on Facebook, Twitter, and Instagram, and check us out on the FreshFoodNY app. E-mail friends@saratogafarmers.org for volunteer opportunities. 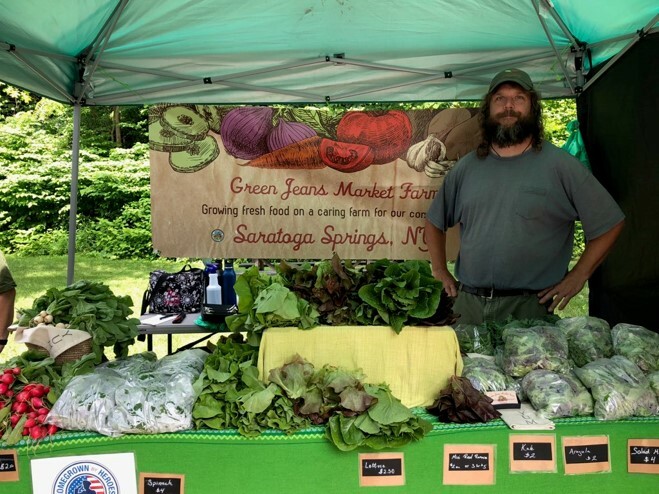 Heitman owns Green Jeans Market Farm, one of the new Saturday vendors at the Saratoga Farmers’ Market. He farms on one-eighth of an acre of land leased from another market vendor, Otrembiak Farm. The land – uncultivated – was covered with perennial grass, six feet tall. It now hosts rows of intensively cultivated vegetables and herbs. Heitman was an English major in college. He graduated, landed a job in technology, and then decided he wanted to become a farmer because he saw it as a means of offering safe and healthy food to his community. He wanted to “do it right” so he picked up a book and learned about how food systems operated. He completed internships at a farm in Denver and with Pleasant Valley Farm, also a Saratoga Farmers’ Market vendor, for a year and a half, “every moment of which was precious.” He also worked with other market vendors to learn how different farming systems worked. Green Jeans became “certified naturally grown” before Heitman sold his first radish. The designation indicates that the farming is done without synthetic fertilizers, pesticides, herbicides or genetically modified organisms. It is comparable to being certified organic except that the certification relies upon peer inspections and direct relationships between like-minded farmers. Heitman does his farming by hand and remains attentive to the natural processes of the land. The evidence of his labor is found at his booth at the south end of the market in the array of greens he brings each week.